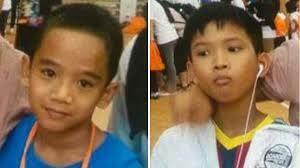 SINGAPORE: Police are appealing for information on the whereabouts of two boys, aged 10 and 12. The two boys, Danial Abdullah and Yusry Abdullah, were last seen at Block 424A Yishun Avenue 11 on Mar 8 (Sunday) at 10.45am, said the Singapore Police Force (SPF) in a statement on Monday. SPF described Danial as 1.55m tall, while Yusry is described as 1.5m tall. Anyone with information is requested to call the Police Hotline (1800-255-0000) or submit information online at http://www.police.gov.sg/CrimeStopper. “All information will be kept strictly confidential,” said SPF.